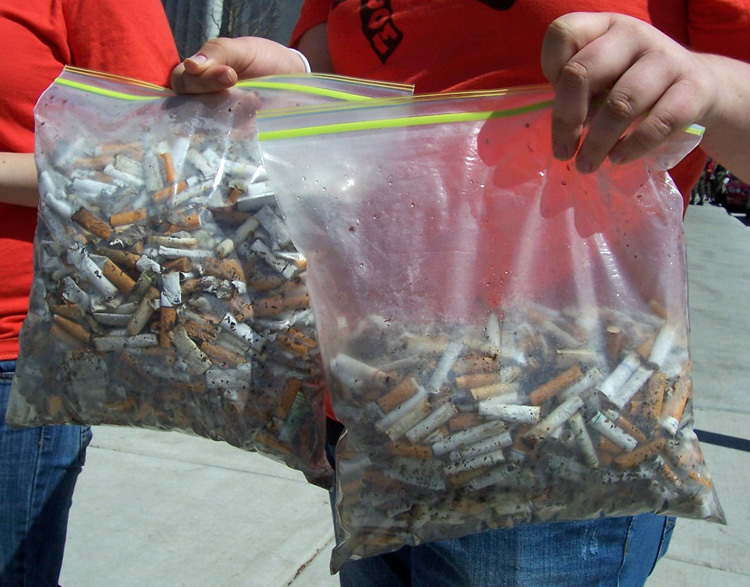 Students from Wisconsin high schools were out on Earth Day picking up "Big Tobacco&apos;s" mess. Fighting Against Corporate Tobacco, or FACT , is a statewide youth tobacco prevention organization which claims members in all 72 Wisconsin counties. Zach Henderson was among FACT members from Sun Prairie High School, picking up cigarette butts on the Capitol Square and State Street in downtown Madison. "We picked up over 5,000 cigarette butts today," said Henderson. 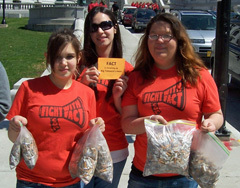 "Big Tobacco is really causing a lot of this litter that we&apos;re seeing around the Capitol. Cigarette butts are the most frequently littered item." That&apos;s true not only in Madison but worldwide: a fact sheet provided by FACT notes that cigarette butts acount for millions of pounds of waste, leach toxic chemicals into waterways, and can take up to ten years to degrade. Henderson says FACT members statewide are paying close attention to the ongoing state budget process, because FACT is state funded. FACT members from Bayfield High School were also picking up butts and raising awareness in their community on the shores of Lake Superior.